A couple of weeks ago I read a post on humor by author Kami Kinard and promptly requested three of the books referenced in her post. Ms. Kinard was actually promoting her second book, but as I hadn’t read the first in the series, I had to read it first and found it thoroughly delightful. Here’s the description for THE BOY PROJECT. Wildly creative seventh grader, Kara McAllister, just had her best idea yet. She’s going to take notes on all of the boys in her grade (and a few elsewhere) in order to answer a seemingly simple question: How can she get a boyfriend? Ah, to be twelve, when everything is the end of the world! 3. The romance – I pretty much knew from the beginning who Kara would end up with, but that was okay. It was still fun to watch her stumble through and figure out how to get to that point. And hey, this is middle school romance, where everything is awkward and confusing and hard to define. 4. The friendship – Kara may have stumbled in the romance area, but she really got the friendship part right. Yes, she had a few moments of grumbling when something in particular happened that I won’t reveal, but she understood what was most important, and I really liked that about her. 5. The adults – I really liked the way adults were handled in this book. They were definitely present, and yet they weren’t set into stereotypes. The parents were involved and cared what happened without being intrusive into the story. And the teachers ran the gamut from taking things personally and getting too involved to being an inspiration and showing genuine caring. I thought they were very true to life. I didn’t mention the humor above–mainly because it was more of an overall thing and I couldn’t find a good snippet to include as an example–but it definitely is another point to recommend the book. As I mentioned in the intro, there’s a second book in this series that follows Kara’s best friend, Tabbi. I plan to pick that one up, too! My students do enjoy this one, but the paper-over-board binding is not holding up well! I wish they wouldn’t use this type! I read it on a Kindle, but see the author’s note below. Thanks so much for the review Michelle! 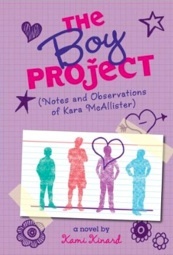 The Boy Problem is a companion novel, so the titles can be read independently, you don’t have to read The Boy Project first, but a lot of people want to. 🙂 I haven’t heard about the binding problem before and I’ve signed a lot of well worn copies at librarian conferences. 🙂 I am hoping that msyingling just got unlucky with her particular classroom copy. 😦 I wanted this to be a happy book that still relates to things middle schoolers care about, and it seems to have hit home. Thanks for seeing that! That’s good to know about the reading order! I always read in order just in case :). Sounds like a fun read for the right person and I have many in mind to recommend this to. Nice to know they can be read independently. Oh my do I have stories, but alas I’d have to change the names to protect the innocent and they’d figure out who they were anyway. Think of it this way, Greg. All characters are composite creatures. Take a little bit from this person and a little bit of that person and you’ve created a new person with a new name. I do have one character who is modeled mostly after a real person — still fictional — but the person recognized herself, and LOVES it! This sounds like a lot of fun. I will definitely put this one on my TBR list. Thanks for the review. Thanks Rosi! I hope it will bring back those funny middle school memories! This sounds like a great read! I love the snippet of the voice, and what you said about how scientific her project is. Ah, middle school, what fun (and awkward) times. Thanks for a fun feature!